4 Bedroom Detached House For Sale in Salisbury for Price on Application. 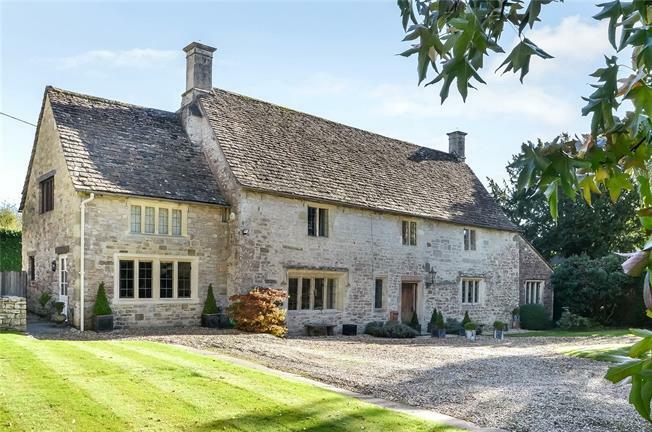 A stunning example of a Grade II listed Medieval Hall House believed to date back to the 1380s and in an area of outstanding beauty, restored and renovated to the highest of standards by the current owners. Speargate House offers lovely lateral accommodation over two floors, sits centrally in its plot and enjoys an enviable position in a quiet village location. The accommodation is immaculately presented and the ground floor offers a fine balance of reception space for both informal living and more formal entertaining, making it a versatile space for all. Its origins provide features typically associated with its era, including open fireplaces, exposed wooden beams, stone-mullion windows and leaded window panes. The sizeable dual aspect drawing room is a particular feature with carved wooden beams, window seats and a very special stone, open fireplace. Across the hall is the pretty dining room with direct access to the Smallbone kitchen/breakfast room. An impressive home office has been created to the north flank of the house and further benefits from its own private entrance. In addition there is a cosy sitting room with a wood burning stove, bespoke pantry, utility room, boot room, cloakroom and a timber framed conservatory which enjoys delightful views over the garden and makes the garden enjoyable even in the winter months. On the first floor are four generous double bedrooms, the master is dual aspect with views over the gardens and serviced by an en-suite bathroom. The second bedroom also benefits from a pretty en-suite and there is a separate shower room to service the remaining bedroom. The fourth bedroom is a remarkable guest suite that has been designed with a statement free standing bath, enclosed w.c. and basin, and views over the glorious gardens. The home office and guest bedroom would be an ideal annexe, or offer income potential, should the new owner require. It is believed that Speargate House dates to the 1380s and was once owned by the Abbess of Shaftesbury (the wealthiest woman in the country). ‘Carpenters Marks’ similar to those at a nearby manor house of a similar period support this dating. The house is built of local Chilmark stone. It was originally thatched, but replaced with Cotswold tiles by the previous owners. The medieval frame and roof structure remains intact and preserved. It is probable that it is the only house of its age in the area that has not been given to the National Trust and has remained in private hands since it belonged to the Wyndham estate. Situated in the highly sought after Nadder Valley village of Dinton. Dinton itself is a quintessential English village surrounded by beautiful countryside offering an array of country pursuits, a Medieval church, community shop, cricket green, pub and a primary and pre-school. The house is in an area of outstanding natural beauty and across the road from National Trust property Philipps House and Dinton Park. Tisbury is 5.2 miles away and offers a direct train service from its station into Waterloo. The well-known Beckford Arms pub next to the Fonthill Estate and the newly opened Royal Oak pub at Swallowcliffe are also nearby. The Cathedral City of Salisbury sits 9.2 miles away with its excellent shopping and recreational facilities and a Waitrose Home and Food store. Salisbury station offers a direct line to Waterloo (83 minutes) and the A303 provides access to the South West and to London via the M3. Dinton is approximately 60 minutes from the Cathedral City of Winchester and the historic Roman City of Bath, both offering excellent shopping facilities. The location offers fantastic schooling including Chafyn Grove, The Cathedral School, Godolphin Girls School as well as Bishops Wordsworth’s and South Wilts Grammar Schools. Speargate House sits centrally within its plot and enjoys beautiful aspects across adjoining farmland and parkland. The house is approached via a gated entrance and a pretty gravelled drive with ample parking for a number of cars. The attractive gardens are a particular feature and the rear of the house enjoys an excellent degree of privacy and seclusion. The garden is planted with mature herbaceous borders, ornamental shrubs and a flag stoned terrace area is well-appointed and enjoys full advantage of the pleasant views. There is a gravelled terrace, ideal for outdoor entertaining and dining bordered by an attractive stone wall. Also found to the rear is a greenhouse, log shed, potting shed and garden shed. The property is approached through a wooden five bar gate with a gravel drive leading to an ample turning circle.